When you purchase chicken eggs at the market, they usually have white or brown shells. 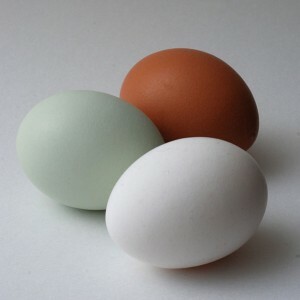 But some breeds of chicken produce blue or green eggs. The blue color is caused by insertion of a retrovirus into the chicken genome, which activates a gene involved in the production of blue eggs. The Araucana, a chicken breed from Chile, and Dongxiang and Lushi chickens in China lay blue eggs. Blue eggshell color is controlled by an autosomal dominant gene: eggs produced by homozygote chickens are darker blue than those from heterozygotes. The gene causing blue eggshell color is called oocyan (O) and was previously mapped to the short arm of chromosome 1. To further refine the location of the O gene, genetic crosses were performed using molecular markers on chromosome 1. The O gene was then located in a ~120 kb region which contained four genes. Only the SLCO1B3 was expressed in the uterus of Dongxiang chickens that produce blue eggs; it was not expressed in chickens that produce brown eggs. Sequence analysis of the SLCO1B3 revealed that an endogenous avian retrovirus called EAV-HP has inserted just upstream of the gene. This insertion places a promoter sequence in front of the SLCO1B3 gene. As a consequence, the SLCO1B3 gene is transcribed. In chickens that produce brown eggs, no retrovirus is inserted before the SLCO1B3 gene, and no mRNA encoding the protein is produced. The retrovirus insertion has occurred at different positions in the Chilean and Chinese chicken genomes. This observation indicates that the insertion arose independently during breeding of chicken strains several hundred years ago to produce blue egg layers. The chicken genome contains multiple copies of endogenous retroviruses, which can duplicate and move to other locations. We can assume that a random insertion upstream of the SLCO1B3 gene was selected for by breeding procedures that were aimed at producing blue egg-laying chickens. The SLCO1B3 gene encodes a membrane transporter protein that mediates the uptake of a wide range of organic compounds into the cell. The blue eggshell color is produced by deposition of biliverdin on the eggshell as it develops in the uterus. Biliverdin is one component of bile salts, which are transported by SLCO1B3, providing a plausible hypothesis for the role of the protein in making blue eggshells. Blue eggshell color is another example of the important roles that retroviruses have played in animal development. One other is the help provided by retroviruses in producing the placenta of mammals. Not all retroviral insertions are beneficial – integration next to an oncogene can lead to transformation and oncogenesis. coinfecting flu-gene into the host’s genome ? P.S. The Corsera virology 101 course is great, although week 6 was a struggle and I am sure 7, 8, 9, 10, and 11 will be a struggle for me also. But I will get through it and try to retain as much as information a I possibly can. I am enjoying the course immensely. Thanks for everything. So interesting! I have a question, does it mean that the chance to generate a recombinant avian leukosis virus in Dongxiang chickens is higher? Tell you this much: those blue shelled eggs just made the best egg salad sliders I think I EVER ate! Yummo and thanks from NYC’s Union Square Green Market!